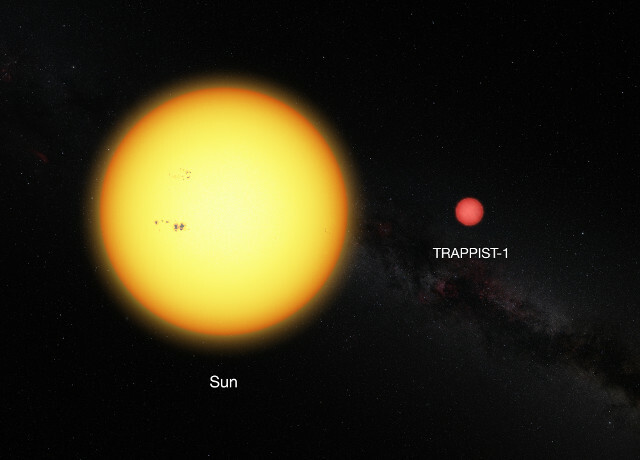 An article published in the journal “The Astrophysical Journal” describes the most accurate measurement of the characteristics of the ultra-cold dwarf star TRAPPIST-1. A team led by astronomer Valérie Van Grootel of the University of Liège in Belgium used new observations and analysis techniques to refine the measurements of TRAPPIST-1. It’s become the subject of a lot of research after the confirmation in February 2017 that 7 rocky planets orbit this tiny star and knowing its characteristics with precision helps to study the whole system. Astronomer Valérie Van Grootel has already participated in a number of studies concerning the TRAPPIST-1 system conducted over the last few years. She started studying that system before the 7 planets were confirmed, also participating in the research that in 2016 confirmed its first 3 rocky planets. In this case, Valérie Van Grootel led another research focused on the star that allows to better measure the irradiation of the various planets and their other characteristics measured by knowing those of the star. For example, the planets pass in front of TRAPPIST-1 so their diameter is calculated through the relationship with that of the star. As a result, a more precise measurement of the reference size leads to more precise measurements of the others. Even before the TRAPPIST-1 system achieved great fame, it was under investigation because it looked interesting from the beginning. For this reason, in this new study of the star the astronomers could take advantage of 188 epochs of observations conducted with various telescopes between 2013 and 2016. This large amount of data allowed to refine the measurements of the star’s characteristics. The new estimate of the mass of the star TRAPPIST-1 is 0.089 ± 0.006 solar masses, a little more than the previous ones but always less than one tenth of the Sun’s mass. The new estimate of the radius of TRAPPIST-1 is 0.121 ± 0.003 solar radii. The new estimate of the surface temperature of TRAPPIST-1 is 2.516 ± 41 Kelvin. The previous estimates were already good but the data accumulated, including some about other ultra-cold dwarf stars at the center of other studies, allowed to improve them. Recent studies provided different results on the habitability potential of the TRAPPIST-1 system’s planets, the ones that will surely be conducted in the future will be able to take advantage of these, more precise, information.